Here's my notes on how I setup my home network backup system in case I forget it. I was first thinking of backing everything to some cloud service like Google Drive or Dropbox, but it will be quite expensive since I have too much home movies, images and sound recordings. So what I've done is that I have one backup of the stuff on a USB harddrive and another duplicate on the HTPC server. The same technique could be used to backup to a server at a friends house to make the backups completely fire proof. Using the old Unix command rsync it is really easy to automate this. 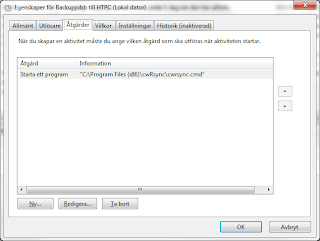 I installed rsync via cygwin, google for cwrsync which is rsync for Windows. My HTPC is a Linux Mint server so I created a RSA keypair for my Linux user and stored the keys on my Windows desktop machine in directory c:\docume~1\Johan\.ssh\id_rsa_rsync_johanhtpc. So now we can authenticate against the HTPC with ssh which rsync supports and I only need to create a configuration of what I want to synchronize. I created a config command file like this. So when run, rsync will check each folder on the Windows harddrive or external harddrive against the directory on the backup server. If new files have been created or existing files are updated they will be synchronized. No action will be taken for directories or files that are unchanged. To automate this, I used the Windows scheduler. I added a task that will run each night at 00:59. It will simply run the above command.